Early preparation is important and it is advisable to set up a small committee with each member having a defined responsibility to organise their part of the display. Neighbours should be informed of your display, well in advance, particularly if there are any young children, the elderly, pets or animals in the vicinity of the proposed display site. Fire extinguishers, buckets of sand and water, should be available on the night with marshals trained to use them. First Aid Posts should be manned by trained stewards and clearly signposted. Ensure you obtain permission from the land owner where the display is to take place. Allow as much room as possible with no overhead obstructions and keep well clear of buildings. 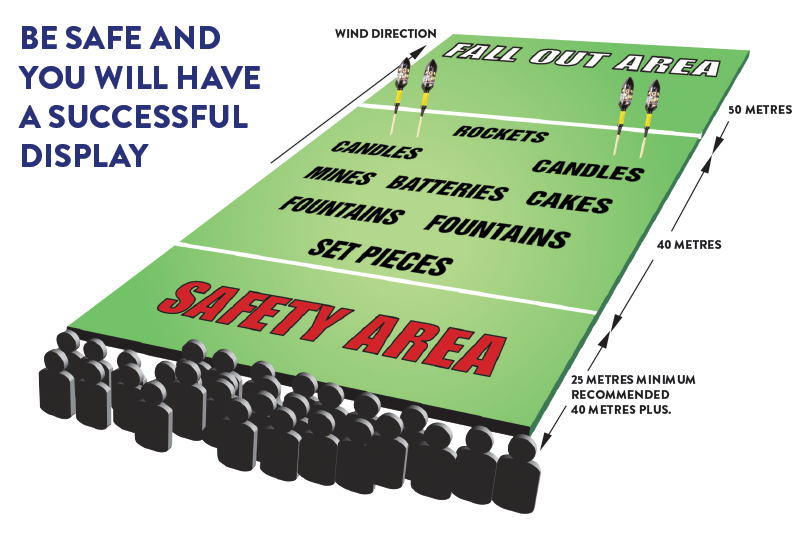 The site should be divided into three areas – the safety area, the firing area and the fall out area. These areas should be clearly defined, marshalled and roped off. Please note the minimum safety distances required between each area. Metal litter bins should be provided for the spectators. Always read the instructions on each firework carefully, well before the event. Fireworks should be stored in a sealed container away from the Firing Site and only taken out as required. On the night it is advisable to wear gloves, ear, head and eye protection. Avoid loose or unbuttoned clothing. Preferably use overalls of a noninflammable material. An electric torch, claw hammer, roll of tape, and pliers will be useful. When unpacking take care especially with fireworks enclosed in a Pyromesh cage, wear sturdy gloves and use snips to remove metal banding and cage then following instructions on the label. Keep away from naked flames, and inflammable material. Never smoke when handling or lighting fireworks. Always light fireworks at arm’s length, and under no circumstances lean over a firework. Never go back to a firework if it fails to ignite. Make sure the set piece, wheel or lancework is securely fastened to the post and cannot fall off. Ensure it is the correct way up and the fuse is in a position that can be reached easily. Should be launched from a rocket launcher angled so that the stick and head fall into the fall out area directly away from the spectators and any obstructions, place the rocket launchers at the back of the set up area. Make sure the rocket launcher is secure and cannot fall over, and the rocket is free to rise. Check that the rocket stick is not stuck in the soil, and remove orange fuse cap before lighting. Insert in soft ground or secure to a stake (which has been sunk into the ground) as directed by the firework’s warning label. Make sure that the firework cannot fall over, and that there are no overhanging trees or cables obscuring the path of the firework. Firers must be 18 years of age or over and should be familiar with all fireworks that are being used, and the sequence that they are to be fired in. Go through the routine with all firers prior to the display starting. Bonfires must always be supervised throughout. They should be down wind of the firing area. Never use inflammables to start the fire, and under no circumstance dispose of fireworks, used or unused on the bonfire. Be prepared for rain. Plastic bags, bin liners and cling film, can be used on most fireworks to great effect against the weather. Cakes and barrages will fire through a single thin layer of plastic. It is important to make sure the spectators are well catered for. The area designated to them must be clearly marked, roped off and marshalled. Make sure that it is large enough. Overcrowding can be dangerous. Check the site for fireworks that have failed to ignite. Carefully submerge them in water. Never put used or unused fireworks onto a bonfire. Please note some rocket motors are made of aluminium which may leave sharp pieces of debris. Ensure the site is cleared of all debris and rubbish.